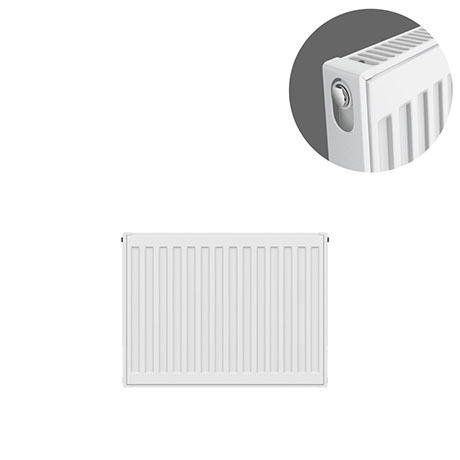 Our range of Type 11 compact single convector radiators will enhance any home with space saving classic elegance and efficiency, they are manufactured using the latest state-of-the art technology ensuring maximum efficiency. Internally welded with a final coating of white enamel (RAL9016) each radiator is degreased and zinc phosphated before being coated with water-based cathophoratic paint. The final coat is applied using an epoxy polyester electrostatic powder coating system that is baked to a hard finish. Comes with a 10 year guarantee against faulty manufacture. All radiators come complete with factory fitted top grille and side panels. Each radiator has 4 x 1/2" connections as standard. Suitable for two pipe installations. For single pipe applications, it is advisable to use diversion tees in the pipework, as this will assist in obtaining design performance from the radiators. Everything required for installation can be found within the robust packaging. Brackets are of a strong design, with open top and deep slots, which facilitates easy and secure installation. Plastic inserts seat the radiator precisely on the bracket minimizing expansion and contraction noise. The neat nickel-plated plug and vent provide a watertight joint, whilst complementing the superior finish. Heat output T50ºC = mean water temperature of 70ºC and room temperature of 20ºC. Heat output T60ºC = mean water temperature of 80ºC and room temperature 20ºC. Sizes indicated may vary by + or - 2 mm.